Since their failed attempts at courtship last season, Dimitri and Ashley have started dating Vanessa, a vivacious woman from Seattle. By all accounts, Vanessa seems like the sister wife of their dreams – someone whose rapport with Ashley is equal to her chemistry with Dimitri. In the midst of their budding romance, the Snowdens decide to move across the country from Atlanta to California and invite Vanessa to leave her life in Seattle and start this new journey with them. Their courtship veers into unpredictable territory as Vanessa has to jump a multitude of hurdles in order to earn a commitment and Ashley’s blessing to become intimate with Dimitri. And ultimately, the trio must confront formidable naysayers who could jeopardize their tender romance. The Alldredges also embark on a new beginning as transplants to Hot Springs, South Dakota. Regrouping from last season’s devastating outcome of their courtship with Melina and Vanessa’s molar pregnancy, they are in the process of building a large home on their new ranch where they ultimately intend to house more sister wives and more children. With renewed hope, the Alldredges find a sensual woman named Jennifer and begin courting! But after an epic rendezvous at Niagara Falls, Jennifer’s sudden change in behavior blindsides the family. After a fire destroyed their Brandon, Mississippi house, Paige and Bernie moved with their two young sons and two dogs into a tiny mobile camper. Rather than letting it get them down, the McGees seize this as an opportunity to embrace a fresh start. Bernie and Paige were previously seeking a sister wife for several years, but their previous attempts sparked jealousy in Paige. After taking a break from the search, they are now ready to dust the cobwebs off their dating profile and put themselves back on the market! Their foray into online dating yields a promising candidate named Brandy, and they seem to be on a fast track to plural harmony, until Paige’s jealousy returns and threatens their hope of ever expanding the McGee tribe. First wife, Tami, and second wife, Sophie, have developed a harmonious way of splitting Colton’s time despite living in two separate but nearby communities in Southern Utah. They all find common ground in their fundamentalist Mormon beliefs, but were excommunicated from the church for practicing polygamy. Although Colton and Tami have been married to Sophie for about a year, the trio has yet to expose themselves as polygamists to the public. They encounter obstacles and supporters in unexpected places as they begin to test the waters of being openly plural. After struggling to find someone that meets the criteria they are looking for in a sister wife, the Winders finally find a prospect who is interested in the family, but she is not interested in revealing herself to the world as being plural. This presents a stark reminder about the perils of being openly polygamous and they are forced to make a decision: should they push forward in their attempts to go public and hopefully normalize their lifestyle, while risking losing someone that could be the next member of their family? Join the conversation on social media using #SeekingSisterWife and make sure to ‘Like’ TLC on Facebook for more updates! 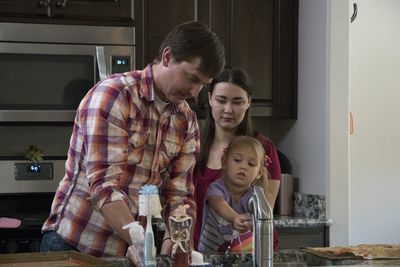 SEEKING SISTER WIFE is produced for TLC by Discovery Studios.